These Swift Books are quite hard to find, especially since you have to compete with Hardy Boys collectors for most of them. All the copies I have are ex-library, so possibly they were not released for public consumption. Although SuperSleuths! recycles the US artwork, the other covers are all original illustrations. However the American Paul Frame internal illustrations are still present. During the 1980s, the first four volumes from the "Be A Detective" series were reprinted, as well as the other peripheral releases, such as SuperSleuths and Camp Fire Stories. Then in the 1990s, Swift appears to have gotten permission to release stories from the "core" series, and produced one each from the Classic Paperback series and the Files. Nancy Drew and the Hardy Boys: Secret Cargo. Artwork by Stanley S. Drate, copyright © 1985 Chivers Press. Only the first 2 titles from the Notebooks series were issued by Mammoth. I'm not sure if this is a situation where they were unauthorized and were told to cease and desist, or if the sales were just so poor that the publisher decided not to pursue any more editions. Some very simple line drawings were thrown together for the covers, and the American internal illustrations by Anthony Accardo are recycled. copyright © 1997 by Reed International Bookd Ltd., London. In 1999, Pocket Books, which is a division of Simon & Schuster UK, decided to reprint several of Files with a snappy and colorful new format. The covers all feature the fractured Nancy Drew logo, and a symbol of the story surrounded by a flower motif. The petals disintegrate into fingerprints at the bottom left of the flower, making the appearance both girly and mysterious at the same time. The colors are quite vibrant and the petals are many of a glossy substance which contrasts nicely with the matte finish of the book. As a marketing promotion, Pocket Books conducted a contest wherein clues were inserted in the beginnings of the first nine books. The clues were in a code which consisted of a series of squares, triangles, circles and spots which the Girl Detective in all of us was supposed to interpret. Best of all, Simon & Schuster implemented a Nancy Drew fan club to garner interest in the revamped series. Enrollment in the club gets you a membership card, "Get on the Case" postcard, "Do Not Cross" sign to hang on your doorknob, code wheel (for solving the code from the contest) and a quarterly Nancy Drew Club Magazine entitled "ClueDunnit?" 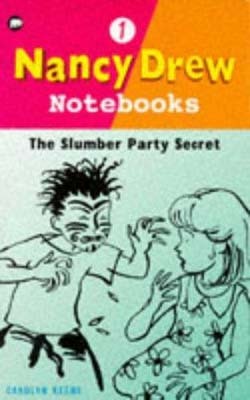 The 4-page newsletters feature promotions for new Nancy Drew releases, Q&A with female Police Constable Natasha Smart, quizzes, cartoons, puzzles and fan letters. It is a highly-produced layout with lots of graphics. Mass Market paperback; semi-gloss finish - 7" x 4 3/8"; image from front wraps around to spine; Pocket Books kangaroo logo; Nancy Drew, flower image and title in stylized writing; Carolyn Keene. Flirting With Danger. Imaging by Black Sheep; copyright © 1999, Viacom International Inc. The Pocket Books are not numbered, and they were released in no particular order; in other words, they do not follow the same numbering system as the previous Armada/Archway books. The first 6 Girl Detective books were released soon after their US counterparts came out, but they were very short lived. The covers all have the same pop art version of Nancy with a thought bubble that gave a teaser for the mystery. The color scheme would change from book to book, but otherwise the graphics are identitcal. Plans were made in 2006 to revive some Files titles using Pocket Book's "fingerprint flower petal"format, but revamped under the Girl Detective brand. Covers were created and posted on online book vendors, but the books were never published. Without a Trace. Artwork unattributed, copyright © 2005 by Simon & Schuster UK Ltd., London. I have seen evidence that the first 10 or so titles from the Nancy Drew Files series were printed in 1988. To date I have never seen one of these Franklin Watts books, and perhaps they were library editions such as the US Greycastle editions.